AtoM allows logged-in users to generate printer-friendly finding aids in either PDF or RTF format. The format and some other parameters can be set by administrators in the finding aid settings. Alternatively, authenticated users can choose to upload locally created finding aids instead of generating them from existing descriptions. Once the finding aid is generated or uploaded, it can be downloaded by any user, via a link provided in the right-hand context menu. 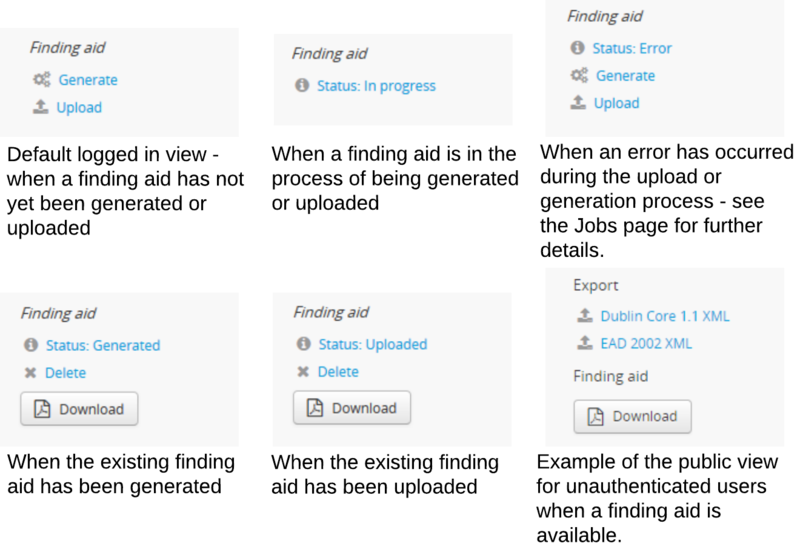 Below you’ll find information on how to configure the finding aid settings, generate or upload a finding aid, view information on the status of your finding aid generation request, and how users can view the finding aid after it has been successfully generated or uploaded. Even if you are uploading pre-existing finding aids instead of generating them from your descriptions, you will need to set the format. During the upload process, AtoM will check that the uploaded format matches this setting, and will not allow you to upload other formats. If you have the “Generate Finding Aid as public user” setting set to “Yes,” the option to generate a finding aid will not appear on any draft descriptions in AtoM. You will have to publish the description before you can generate a finding aid. You will still have the option to upload a finding aid - but remember, if the associated description is in Draft mode, users won’t be able to access it, or your uplaoded finding aid until it’s published. Once you have configured the finding aid settings, you can now begin to either generate or upload finding aids for your archival descriptions. While the settings can only be configured by an administrator, at present any authenticated user can generate or upload a finding aid for a description they have permission to view. An administrator can review all finding aid generation requests via the Jobs page - for more information on managing jobs in AtoM, see: Manage jobs. You can only generate or upload one finding aid per archival unit (that is, one descriptive hierarchy), but you can generate or upload from any level of description in the hierarchy, not just the parent description. In the right-hand context menu, you will see a section titled “Finding aid”. For logged-in users, this menu may include status information, and if a finding aid has already been generated or uploaded, a download button for the current finding aid. Status messages are never shown to public users - the finding aid section will only appear in the context menu if a finding aid has been successfully generated or uploaded. No status: No finding aid has been generated or uploaded for this description. Generated: A finding aid that has been generated is available. 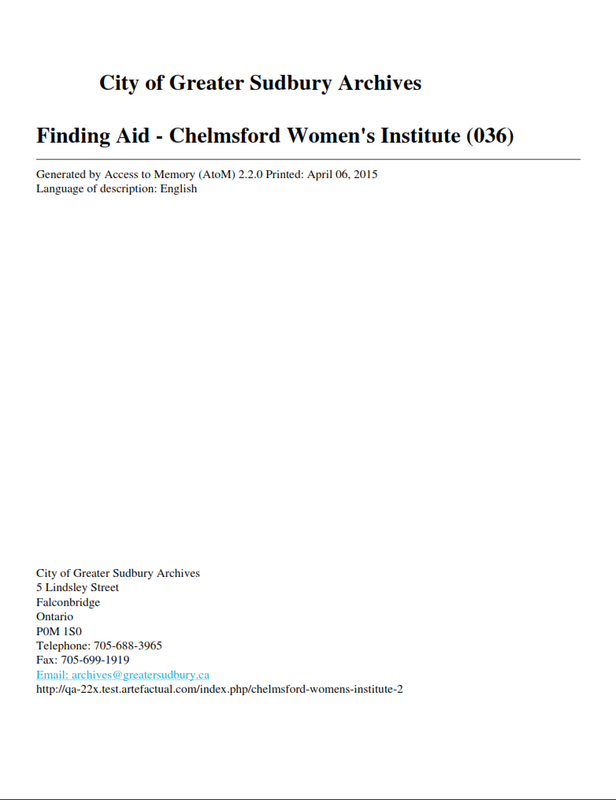 Uploaded: A finding aid that has been uploaded is available. Don’t see the option to generate a finding in the right-hand context menu? It could be because your archival description is still in draft status, and your Finding aid settings are set to “Generate Finding Aid as public user.” AtoM will hide the link to generate finding aids from any draft descriptions when this setting is engaged. You can either change your settings (see above), or you can publish the description - see: Publish an archival description. You’ll still be able to upload a finding aid to a draft description, but remember: your public users will not be able to see the descriptions or the finding aid until the descriptions are published! To generate a finding aid from your archival descriptions, click the “Generate” link in the Finding aid section of the right-hand context menu. AtoM will reload the page, and the Finding aid section will display a status message of “In progress”. To upload a finding aid, click the “Upload” link in the Finding aid section of the right-hand context menu. AtoM will redirect you to a page where you can select a finding aid from your local computer. When ready, click the “Upload” button. After upload, AtoM will redirect you to the archival description view page - you’ll see the status message in the finding aid section of the right-hand context menu will read “In progress” as your finding aid is uploaded. To update the status and determine if your finding aid was successfully generated or uploaded, wait a moment for the process to execute, and then refresh the browser. Alternately, you can navigate to the jobs page for more details about the status of a job - see: Manage jobs for more information. If the finding aid has generated successfully, you will see a Download button when you refresh the page. The status message (visible only to logged-in users) will indicate if the existing finding aid was generated or uploaded. Click on the Download button to view your finding aid. If your description is published, unauthenticated (e.g. public) users will now be able to see this Download link as well - they will not see the status messages or delete options, however. You can re-generate or re-upload a new finding aid at any time by first deleting the existing finding aid (covered below, and then following steps 1-6 again. This can be useful if you make edits to your archival description or its children, or if you change the format of the finding aid in the settings. The finding aids are not automatically updated when you make edits to your descriptions. Be sure to re-upload or regenerate a new finding aid if you have made changes. Each archival unit (i.e. 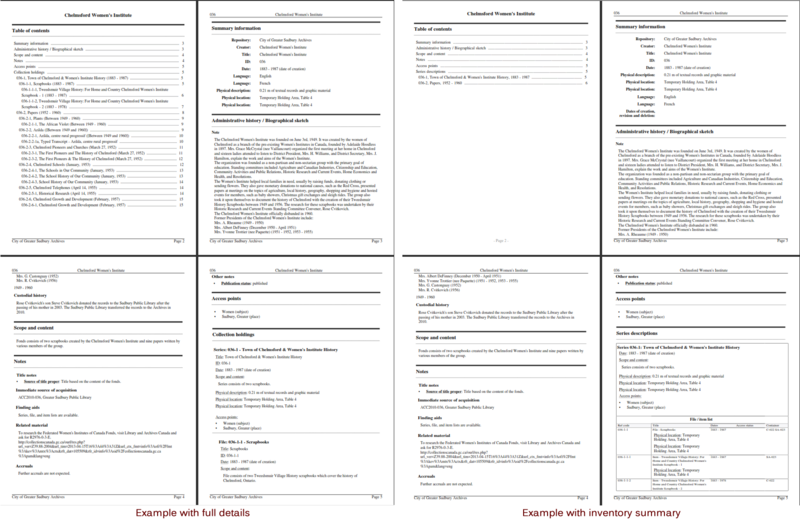 descriptive hierarchy) can only have one finding aid associated with it, and finding aids are not automatically updated when descriptions are edited. If you wish to generate or upload a new finding aid to an archival unit that already has a finding aid, you will need to delete the existing finding aid first. You must be authenticated (e.g. logged in) to be able to delete existing finding aids or add new ones. Navigate to the archival unit whose finding aid you wish to delete, and locate the Finding aid section in the right-hand context menu. You can do this from any level of description in the hierarchy. In the Finding aid section, click on the “Delete” link. AtoM will redirect you to a confirmation page. Click the “Delete” button if you are certain you would like to delete the existing finding aid. Alternatively, you can click the “Cancel” button to abort the delete operation. After clicking “Delete,” AtoM will redirect you to the archival description view page. You can now upload or generate a new finding aid, following the instructions in the section above. Now you can re-generate your finding aids, following the steps above, Generate or upload a finding aid. Note that you will still have the option to upload a finding aid to a draft archival description - but remember, your public users will not be able to see the archival descriptions or the related finding aid until the archival unit is published. If you restore your internet connection, you can try again - the issue may now be resolved. If not, it may have to do with the content you have added to your archival description. You’ve used unescaped special characters, such as ampersands & or < and >. We suggest you try reviewing your description(s) in edit mode and look for some of these common errors that can affect EAD export. Remove any HTML you have added inside AtoM’s edit fields. Make sure that you replace any non-standard punctuation cut and pasted from common word processor applications.